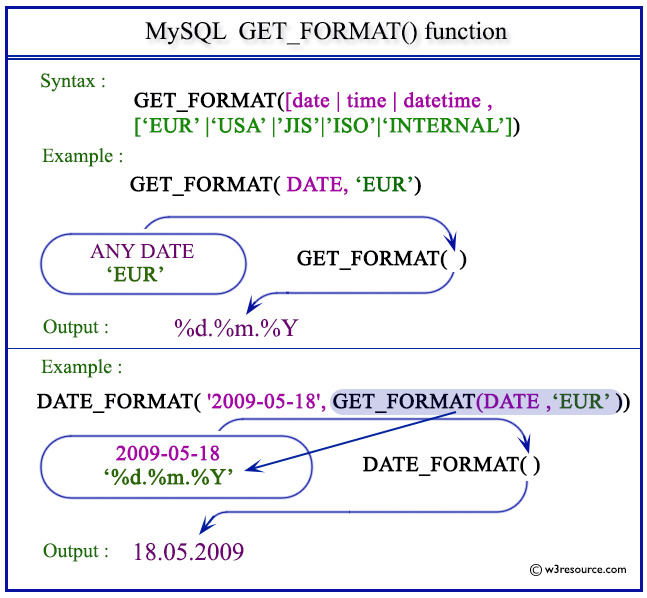 MySQL GET_FORMAT() converts a date or time or datetime in a formatted manner as specified in the argument. This function is useful in combination with DATE_FORMAT(). The various formats have been described bellow. date | time | datetime A date or time or datetime. EUR’ | ‘USA’ | ’JIS’ |’ISO’ | ‘INTERNAL Different formats. The following statement will arrange the date format in EUR. The following statement will format and return the specified date 2009-05-18 in the format obtained from GET_FORMAT(DATE,'EUR'). The following statement will arrange the time format in USA format. The following statement will format and return the specified time 11:15:46 PM in a specific format as obtained from STR_TO_DATE(TIME,'USA'). The following statement will arrange the datetime format in JIS format. The following statement will arrange the datetime 2009-05-18 11:15:46 in a format obtained from GET_FORMAT(DATETIME,'JIS'). Click here to see the MySQL Date and time functions.